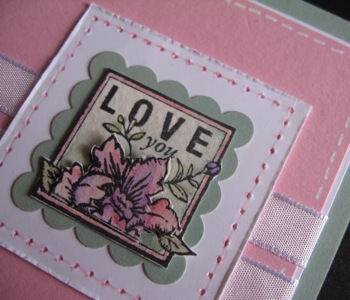 Faux Stitching Helps You Create A Hand Stitched Illusion On Cards And Scrap Pages. What is Faux Stitching? How is it done? Does it look as good as the "real thing"? I now think the answer to the last question is a definite "yes". The reason for my answer is that I'd always believed the real thing, that is getting the sewing machine out and stitching through the card, was the best way to stitch in my paper craft. Now after teaching numerous card making classes that included faux stitching I've seen how many people really believe they are looking at sewing with a needle and thread when in fact I've created the impression using just a couple of tools and my Stampin" Write Markers. There are two different faux stitching methods used in this example. 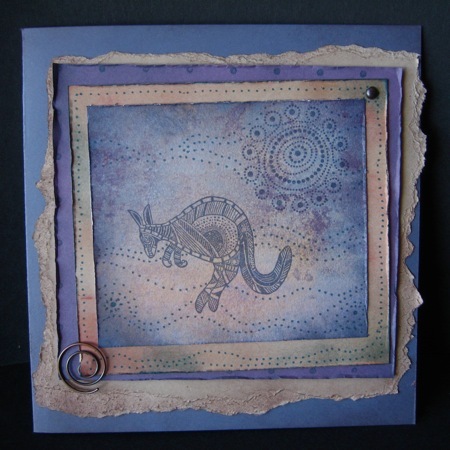 Both are quite easy to create, and each method has it's place, depending on the style or genre of card or scrap page you're making. The first method (pink stitching on white card) is created by using a paper piercer and guide to evenly pierce holes through the card stock. Then the holes are joined with a coloured line - something like making a dot-to-dot picture. HINT Always use the journalling end of the marker. It is much finer and gives you a line more like a piece of thread. Make sure you allow the tip of the marker to go down the hole. As you move from hole to hole the lines between will be a little crooked - this is exactly how a machine sews. You'll have people wondering whether that is real stitching they are looking at! Just remember that to achieve realism you need to be less than perfect. The second method (white lines on pink card) requires a little confidence because it is done "free hand". It's a good idea to have a preliminary practice on a spare sheet of card before attacking your work in progress. Decide the length of the stitch you want and then try drawing a reasonably straight line making little dashes as you go. Use the exact equipment you plan to use in your project, as results differ using different media and card. Find the most comfortable way to get uniformity with the dashes. You may like to turn the page on an angle, or work from Left to Right. You might prefer working horizontally, that is across the page, or others may find working vertically, down the page give them a better result. Some crafters may feel more comfortable using a ruler as a guide, but care needs to be taken not to smudge the ink. Some inks dry very quickly and are therefore more suitable for using with a ruler. The Aboriginal theme card uses "stitching" in a different way - lots of small dots that create trails across and around the card. Stitching comes in all different shapes and sizes, and that enables you to take some "artistic license" when creating your faux stitching. 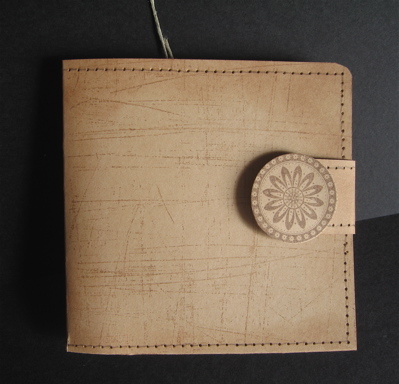 The paper wallet uses both faux texture and faux stitching to create the look of "well-used leather". These effects are simply created with a stamp, ink, paper piercer and matt pack guide and co-ordinating Stampin' Write Marker for the "thread" lines. Inspiration for faux stitching designs from machine embroidery and quilting. There are many more stitches than simple straight stitching. Zig-zag stitching is created by poking alternating holes in 2 rows of the piercing template from the Matt Pack. Then just connect the holes back and forth to create your "stitches". Create cross stitch by piercing every hole along two rows of the template. then draw 2 lots of zig zag lines - this time joining every second hole along each line. Blanket Stitch is very popular and can be used to create individual cards and scrap pages. The more adventurous faux stitchers could try Herringbone or other more advanced embroidery stitches that can easily be replicated with pen and ink. Many paper crafters make faux stitching a signature of their work. 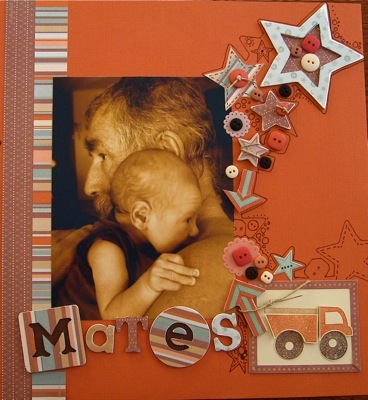 It is particularly suitable to country theme crafts as it assists in the "home sewn" look. Another idea is to create your own shapes, like a flourish or a paisley shape, a heart, square or star: print it onto some paper then pierce holes through the lines on the paper to create the same design on your work. This method allows you to really get your creativity going. There are many shapes that are suitable to outline in stitching, that will give you infinite scope for individual and creative paper craft work. Do You Use Faux Stitching In Your Craft? It's easy to do, and it's great fun to see your work on the world wide web. You can alert friends and family to the web page, and they too can enjoy your artwork, whether they live in the neighbourhood, interstate or overseas. To get started on stitching view this tutorial at Splitcoast Stampers.